This is a scalable context timeline. It contains events related to the event January 9-13, 1991: Congress Authorizes War with Iraq. You can narrow or broaden the context of this timeline by adjusting the zoom level. The lower the scale, the more relevant the items on average will be, while the higher the scale, the less relevant the items, on average, will be. One of the many air strikes launched against Iraqi targets during Operation Desert Storm. [Source: US Air Force]The US launches a massive air assault against Iraq in retaliation for that country’s invasion of Kuwait (see August 2, 1990). The air assault begins the day after a UN deadline for Iraq’s withdrawal from Kuwait expires (see November 29, 1990). F-117 Stealth bombers hit Baghdad with an array of high-tech bombs and missiles; many of the explosions are televised live, or on briefly delayed feeds, on CNN, which launches virtually 24-hour coverage of the air strikes. In the first 48 hours of the war, 2,107 combat missions drop more than 5,000 tons of bombs on Baghdad alone, nearly twice the amount that incinerated Dresden in World War II. 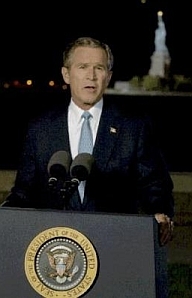 Bush giving his speech in front of the Statue of Liberty. [Source: September 11 News (.com)]The Bush administration’s public relations team decides to kick off its push for a war with Iraq, and its drive to the midterm elections, with President Bush’s speech commemorating the first anniversary of the 9/11 attacks. After much deliberation, Ellis Island in New York Harbor is chosen as the setting for Bush’s speech; the Ellis site won out over nearby Governors Island because the senior public relations officials want the Statue of Liberty as a backdrop. “We had made a decision that this would be a compelling story either place,” White House communications director Dan Bartlett will later recall. “We sent a team out to go and look and they said, ‘This is a better shot,’ and we said okay.” Leading that team is Scott Sforza, the former ABC producer who will later oversee the May 2003 “Mission Accomplished” event (see May 1, 2003 and April 30, 2008). [Rich, 2006, pp. 57-58] (Deputy press secretary Scott McClellan will later write of Sforza, “Reagan’s team had perfected this art of stagecraft, and the man in charge for Bush, deputy communications director Scott Sforza, took it to new heights.” [McClellan, 2008, pp. 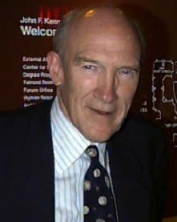 82] Sforza is joined by former Fox News producer Gary Jenkins and former NBC cameraman Bob De Servi. They use three barges laden with stadium lights to illuminate the Statue of Liberty for the shoot. Former Reagan administration public relations chief Michael Deaver will later observe that the Bush team is far better at this kind of marketing presentation than the Reagan, Bush I, or Clinton public relations teams ever were. “[T]hey’ve taken it to an art form,” Deaver will say. The speech is designed to push Congress towards authorizing the war before the midterm elections (see January 19, 2002 and October 10, 2002), when, as author Frank Rich will later write, “the pressure on congressmen facing re-election to prove their war-waging machismo would be at its nastiest. Any weak sisters could expect a thrashing much like that Republicans inflicted on Democrats who had failed to vote for the ‘use of force’ resolution sought by the first President Bush after the Persian Gulf War in 1991” (see January 9-13, 1991). A senior administration official says, “In the end it will be difficult for someone to vote against it.” [Rich, 2006, pp. 57-58] In other preparatory moves for the speech, the government raises the National Threat Level from yellow to orange (see September 10, 2002), and announces the death or capture of some 2,700 al-Qaeda operatives since 9/11 (see September 10, 2002). The administration will also attempt to significantly revise its account of events on 9/11 itself (see September 11, 2002). Sen. Richard Durbin. SJ Res. 45 with Amendments 4865 (Rejected) - To amend the authorization for the use of the Armed Forces to cover an imminent threat posed by Iraq’s weapons of mass destruction rather than the continuing threat posed by Iraq.